So many of us try to do life alone. Not that we don't have friends, or that we are anti-social. No, not that. But when difficulty and stress arise in our lives, we resist outside assistance. We squeeze our pride tightly like a precious treasure and plunge headfirst into life--all by ourselves. Or perhaps more accurately, all by myself. If you happened to glance at the title image, you noticed there are people running. 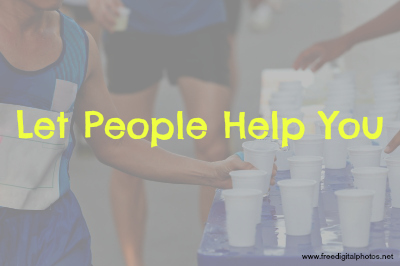 People that are enduring such a torturous task as running need some help. They get hot, tired, and thirsty. So along the way, most organized running endeavors have drink stations along the way to help the runners stay hydrated. Imagine the runner that insists on doing everything himself. He resists all attempts to help him, and so he must carry big heavy water bottles with him throughout the entire run. This might not seem like a big deal, but if you've ever run further than five miles, you know that "little" water bottle will start feeling like a 1,500-pound gorilla by the end of mile three. Using this analogy, consider how often you "run" through life and refuse people's generous attempts to help you. You don't have a good reason, yet you decline their help. You don't have a problem with the person offering help, but you just think you can handle it yourself. But ask yourself, "Why are you resisting help?" 1. It feels like you are admitting failure. I have a problem with my emotions. They lie to me. They tell me things day after day that simply don't make sense, and they don't line up with the facts. This ridiculous feeling of pride makes us apprehensive to accepting help. People offer, and we feel like, "No, I'm fine. I'm good. No thanks. I got this." In the mean time, we're dragging 1,500 lbs. of water bottles along with us for the marathon. We get exhausted, hot, tired, thirsty, but we still feel like we can handle it. You are not failing when you accept help. 2. You don't want to feel indebted to someone. For many of us, receiving help from someone means we need to mentally tally up the "tab" we have with that person. When they help you, now you "owe them one." This is tricky, because some people really do expect you to pay them back for their help. They think their "help" is part of the barter system. If these are the people offering you help, you may want to decline. However, most people I've received help from in my life are not like this. They offer help out of kindness and genuine friendliness. If these people help you, don't keep track of everything they do and try to repay them. They don't want to be repaid. If they fall on hard times, should you offer them help? Yes. But don't respond to kindness with a feeling of obligation to repay. That's not friendship. That's a business relationship. Whether you need a drink, help moving, or a ride to/from work, you'll be happy to know that being helped will get you out of tight spots. When you're stressed out and about to snap, and someone offers to babysit for free, or help you fix your car, accept their help and just say "Thank you." As I mentioned earlier, living life "on your own" doesn't mean you avoid people. It just means that you try to carry all the burdens and stresses of life without any assistance. The really sad thing is that sometimes we don't even want to accept help from people closest to us--spouses, parents, brothers, sisters, and good friends. When you accept help, you start learning a valuable lesson about life. You're not expected to do everything independently. Receiving assistance does not mean you have failed. You can tell a great deal about a person by what they are willing to do for someone who cannot repay them. When someone helps you, you find out what type of person they are. And some of those people, if they are not already your friends, will become lifelong friends. Receiving help opens our eyes to the fact that other people might need help too. Since we've been fortunate enough to receive help from someone, perhaps we can "pay it forward" by helping someone else. You don't have to pay someone's mortgage or pull them from a burning building to be helpful. Just listen to people, pay attention, find something to help with, and take initiative. The world will become a better place.